The most beautiful broccoli we’ve ever seen (at least in recent memory) arrived today. Yowza. We’ve got Fuji and Pink Lady apples gracing the table. I don’t think I’ve yet partaken of the Pink Lady craze, so I’m excited to see what all the fuss is about! Fennel bulbs make their first fall appearance for us, and I’m torn between shaving them thin for salads or roasting them into caramelized gooey sweetness. Country style spare rib with pan seared apples. Mashed potatoes and celeriac. Yum. I finally made chili on Monday night, but I forgot to take a picture! It’s probably okay — chili, I think, is not particularly picturesque. It was everything I hoped for — warm and comforting, and a great way to use up some of the last bell peppers languishing in my fridge, plus a little of the hot peppers we’ve accumulated. Although I really didn’t even make a dent in the hot peppers. Dusty, you see, planted an all-pepper garden, including (at least) one of every hot pepper plant for sale at Highland Garden the weekend he got it in his head he wanted to plant some things. The peppers have names like “World’s Hottest Pepper”, which makes them…..not exactly my cup of tea, at least not in any significant quantity. I thought maybe those peppers would just die on the plant with the first frost, but when the forecast threatened last Thursday night, Dusty went out and harvested what must have been hundreds of peppers (since some of them are the type that are smaller than my pinky nail). He dried some of them in the oven, and the rest got chopped up and put into a big glass jar with an airlock to become a fermented hot sauce in the style of the Naturally Fermented Green Sriracha we carry — except way, way hotter. I don’t know if I’ll be brave enough to try it. My pepper world tends to revolve around the not-so-hot — the New Mexico Green Chilis, the Carmen di Toros (not hot at all), and, of course, the habanadas. On my horizon still is a round of Habanada Confit, which I can’t believe I haven’t gotten around to yet, and which I highly recommend you get around to very soon if you’re hoping to at all. But of course the peppers are waning, and I’m also turning to more solidly fall things. My brother-in-law treated us to his awesome beef and broccoli recipe this past weekend, using fresh ginger, a Pecan Meadow New York strip steak, and, of course, R&R broccoli. It was definitely the most luxurious beef and broccoli I’ve ever eaten, and a perfect seasonal treat. I love that ginger is warm and zesty at the same time, contributing to a sense of both deep comfort and bright freshness. Also on the ginger kick, on Friday night, while we were roasting six pounds of beets for a potluck the next day, I made a round of Japanese buckwheat noodles with a miso/ginger dressing, plus some sliced up red radishes for crunch. I definitely should have made extra dressing to keep in the fridge. I guess I’ll just have to do it again…. I’m also dreaming about the Roasted Butternut Squash & Toasted Farro Salad with Curried Brown Butter on Food52. We’ve got b-nut, shallots, farro, Calicutt’s Sweet Curry, butter, and even arugula. You’ve got everything else in your pantry, or at least at Green Ridge Acres. Let’s do this! P.S. That pic is adapted from David Tanis’s recipe for Pork Chops with Apples and Cider. We used country style spare ribs, because we love them so much. We didn’t have hard cider on hand, so Dusty subbed in a combo of fresh cider and Keepwell Granny Smith vinegar. Fall is a little pensive, a little romantic, and a little sad. Every year I fall in love again with our collective emotional shift — the way we all seem to be preparing each other and ourselves for the cold months to come. The market is a little warm, bright, and bustling, and college campuses seem to be in their natural habitat. When this time of year comes around I really try to savor it. For me, that means a LOT of little rituals: Pumpkin picking, corn mazing, Halloween costume planning, and of course cooking. Naturally, I tried our seasonal spice from Calicutts this week, Autumn Harvest. It tastes exactly like it sounds; mapley, cinnamonny, and gingery, with the bitterness of allspice and nutmeg. One thing I love to do in the morning, when the days get shorter and the sun is just streaming through the window, is add a little bit of cinnamon to my morning coffee. I substituted Autumn Harvest and it enhanced the fall flavor by A LOT. I sprinkled it over my oatmeal, added it to some granola, and mixed it with a little sugar and butter and spread it on toast. It’s been a staple in my morning fall rituals. 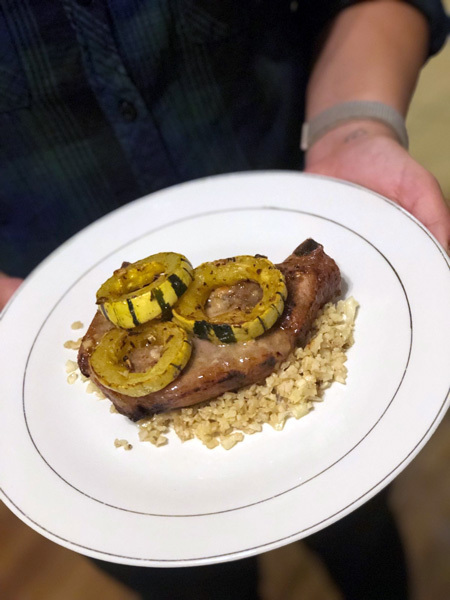 My absolute favorite fall meal this week was a maple glazed Pecan Meadows pork chop over Parmesan (or Royer Mountain) cauliflower rice, topped with delicata squash “donuts.” The glaze called for paprika, cumin, maple syrup, melted butter, salt, a little Dijon mustard, and cinnamon which I replaced with Autumn Harvest. Then, for dessert — a hot toddy with fresh grated ginger, juice from half a lemon, a chamomile tea bag, a splash of whiskey, and a sprinkle of Autumn Blend stirred in. Yum!